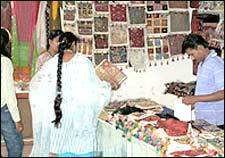 Arts & Handicrafts Exhibition By Society is an event that took place between 08-Dec-2006 and 11-Dec-2006 in Hyderabad. From those for whom Rs. 100 means bugdet to those for whom Rs. 100 means change, there is somthing for everyone this weekend in this crafts exhibition. Society magazine is hosting an arts and crafts exhibition, at the Kotla Vijay Bhaskar Reddy Indoor Stadium in Yousufguda, from 8th to 11th December, where artisans from different states of India, Pakistan and Kenya are exhibiting their products. The exhibition houses an artistic range of products like handcrafted gold, silver & diamond jewellery, traditional & designer garments, bridal wear, trousseaux, Lucknowi chikan, hand-woven & hand-embroidered suits & saris, gift boxes, designer pottery, sculpture, wall hangings, murals, Rajasthani, Tanjore, Madhubani, Mogul & 3D paintings, curios, statues, antiques, silver & glassware, stained glass, gemstone & semi-precious stones, crystal, artefacts in terra-cotta, brass, bronze, wrought iron, glass, wood, bamboo & silver, handicrafts, wood carvings, bed spreads, cushion covers, picture frames, table decor, hand-painted crockery, hand-made stationery, eco-friendly jute bags, planters, marble, stone carvings, Kashmiri carpets, dhurries, wrought-iron furniture, candles, diyas, decorative torans, onyx stones and floral arrangements, designed by artists and craftsmen from Karachi, Bastar, Chandigarh, Chittorgarh, Bhilai, Assam, Kutch, Pondicherry, Kalpi, Jaipur, Orissa, Dahod, Lucknow, Muzzafarnagar and other parts of India. In addition to the above, there is a large collection of handcrafted, traditional, ethnic designer wear, modern & trendy designer wear, and bridal designer wear, which stand as the centre of attraction. The prices range from Rs. 50 to upwards of Rs. 4 lakhs. All major credit cards are accepted. The entry is however by tickets of Rs. 30 per head. For further details, please contact the venue. Be the first to comment on Arts & Handicrafts Exhibition By Society! Just use the simple form below. fullhyd.com has 700,000+ monthly visits. Tell Hyderabad what you feel about Arts & Handicrafts Exhibition By Society!